"We at Shade Shack would like to thank you for providing us with a terrific line of sunglasses and associated products to market. As you know, we have been selling and servicing Flying Fisherman Products to our retail customer base since 1987. 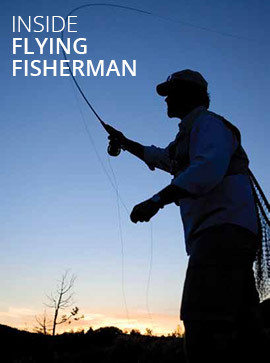 Your continuous effort to update and improve your line has made Flying Fisherman our most important supplier. The consumer acceptance has been nothing short of fantastic." Jim McNulty - Shade Shack, Inc.
"A few words about doing business with Flying Fisherman: Henry's has enjoyed our association with this company for many years. The best thing I can say about our business with them is that it continues to grow. Through good markets and soft ones, the folks at Flying Fisherman, Pat and Linda, have continued to work with us as a valued supplier should; offering new products and styles that drive business while maintaining the consistent flow of goods that a wholesaler needs. The best thing I can say about doing business with them is that they take pride in what they do, do it professionally and creatively, and realize that in order to remain successful the personal, "hands-on" approach must always come first." "... we have numerous dealers that we service on a weekly basis. We have always had very positive results with Flying Fisherman products. They sell very well for our dealers and the customers love the quality for the price paid, and the support they give is nothing short of fantastic !!!" "Just a quick note to tell you how happy we have been the last two seasons with the service and product from Flying Fisherman. The help we get from you and your staff and the promotions you offer have made your line of quality fishing glasses very profitable for our dealers and for V.F.Grace Co. here in Alaska. Thanks again for your efforts." "This is to let you know how grateful we are being a distributor for Flying Fisherman Sunglasses, Hats and T-Shirts. The staff at Flying Fisherman is very courteous and helpful. Their shipping response time is immediate, which is what we need when you are down to the bottom of your inventory! And the return policy is easy. This is good for our customers when they have a problem; we just replace the defective item. The Flying Fisherman products have an amazing turn over rate. We sell their products every day. They have a great selection and the products are high quality, which is why I don't feel the need to carry any other line of sunglasses." You are awesome!! Thanks you for your great service. Our customer is very, very happy. I know he will continue to purchase Flying Fisherman. These lenses are for his first pair. But he purchased a 2nd pair for dress wear, and will continue to have a separate pair for work. He is so happy with your products and service. "Love the product, one of our best sellers!" "They are great quality glasses, I prefer them over Sea Striker and Calcutta." "It's a solid line to where you don't have to worry about looking for other product names. I've been selling them for 20 years!" "Flying Fisherman is the easiest product we sell in our store. They sell themselves and fly off the shelf! We have 4 r-48 display packages in the store and sell out of them every year!" "We've been selling Flying Fisherman Polarized sunglasses for close to 20 years, and we have always done really well with them!" "I would like to restock my display with more glasses. I am really happy with your product. I purchased your products at the all sport show in vegas last year and am sold out. please contact me asap. Thanks. P.S. How about some of those lime candies!!!!!" My wife sells Luxury eye wear and has been trying for years to talk me into a pair of high end glasses...I just keep telling her no thanks and keep ordering my Flying Fisherman glasses! Now I can add great Customer service to the list as well! Thank you again. I don't fish. I have never been a fan of sunglasses. That is until 2 years ago when I bought a pair from Sport Authority when they were going out of business. I have fallen in love with these glasses! Sadly they met their demise when my toddler decided use my nail file on the lenses! Now I can't find the same pair! I bought Nassau 7380TA. You have that line but they're all reader glasses. Mine weren't reader ones. Do you still sell ones that aren't reader? Can you help me find some!? Even if you can't I just wanted to tell you that your sunglasses are AMAZING and I am such a HUGE fan now! I always hated sunglasses until I tried a pair of yours. Thanks for making such a great product! Love the product, great customer service from you and just a pleasure to work with. Thank you so very much!!! I will recommend your products to anyone. Service like you just provided makes a huge difference and Is sincerely appreciated by me. Thank you, thank you!!!! Happy fishing! Not sure how many of these types of emails you get but I just wanted to say "thank you"! Thank you for making a quality product and an affordable price. Last year, roughly around this same time I was looking for a set of sunglasses. I live in the Texas Hill Country around 5 different lakes, but I was also scheduled to go in September to Colorado for a reunion with a bunch of Marine Corps (USMC) buddies and we would be doing some trout fishing as well. After surveying the field, I stumbled on a good review of your sunglasses. I can't remember where I saw it. I bought a pair and I fell in love with them! They are awesome! I managed to lose them in October and I couldn't stand it. I immediately got online and bought another pair! Same style (Tailer) and everything! I'm thinking I might need to buy another pair just incase I lose the ones I have now! Just so you know, you're doing a good job and making a great product. Thank you for a great pair of sunglasses! I would like to thank you for the help with my sunglasses. I received them today and they are fantastic. I have always bragged on the old glasses to my friends, now I can brag on the service you provide to your customers as well. Take care and many, many thanks. Thank you for that. And thank you again. “I received my new pair of sunglasses yesterday and just wanted to thank you for your assistance. I've enjoyed your product over the years and look forward to many more. I am messaging you from Zimbabwe. As you can see, I am wearing my trusted Maverick, I never move without them." "Thanks a ton! I gotta say I love my FF glasses, and talk them up at every tourney and gathering!!" "Thanks for the quick turnaround on getting me my Pro Staff package, after 1 day on the lake I can tell everything I have read about Flying Fisherman sunglasses is true." Just wanted to drop a line to say how pleased I am with the Flying Fisherman line of sunglasses, I am not a fisherman but enjoy the styles, quality, and clarity that your line of glasses offer. You really do not need to be a fisherman to take advantage of the Master Angler Series Polarized Lenses, it is amazing all of the things that I can now see that my previous (non Flying Fisherman eyewear) offers me. I have been a customer for years, and will continue being a happy customer, the 3 levels or series of glasses you offer are all outstanding. Here is a fact: I destroy sunglasses, your product lasts much longer than others that I have owned, but even your outstanding line can not stay with me, not because of it?s quality, but because I leave or loose glasses about as fast as I loose my hair. Because you offer so many different and cool styles, I have several sunglasses in my possession and as I leave them somewhere, I replace often at my favorite Wal-Mart. I deal with customer service situations often, both as a customer and in my professional arena. Your customer service was impeccable. Please email me the name and contact information of your supervisor if you would be so kind. I've been using Flying Fisherman sunglasses for a few years now and I love them. 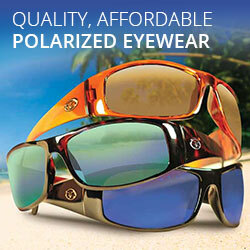 They are comfortable and affordable and do an excellent job of cutting down the glare off the water. Wearing sunglasses while fishing also has another important meaning for me, Safety! I lost an eye when I was a kid in a streethockey accident. I won't fish without a good pair glasses on my face. I have had at least one occasion where my pair of Flying Fisherman glasses has saved me from possibly being blind. Just wanted you to know that I have had new artificial lens implants and can see 20/20 for the first time in mylife. The first thing I did when they removed the patch after the last surgery was drive over to Capt. Harry's in Miami and buy a pair of Flying Fisherman sunglasses. I now have Flying Fisherman sunglasses stuck every where. I can buy a whole rack of them for the price I used to pay for one pair of prescription polaroids. They are every bit as wonderful as yo uhave always told me. I am a born-again Flying Fisherman addict. Keep up the good work and have a wonderful Holiday season. I wrote an article a couple of years back on safety and fishing, where I shared an experience in which a client on a guide trip hit me directly in the eye with a big Muskie lure. Had it not been for my Flying Fisherman sunglasses, I'm sure that I would have been lying on an emergency room table too, Thanks! I got the Sunglasses yesterday and as before...they're the bomb. Thanx. These are somewhat flatter then my other ones. My eyelashes touch the lenses on these...Easily fixed with nose pads. I've had many many sunglasses, including the $450 Polaroid titanium framed variety. Any Flying fisherman types are scores better then any other sunglasses I've ever had...howzat? This pair will go across the USA when I do my bicycle trip next year. Y'all oughta be proud of yourselves. "I just wanted you and eveyone with your company know how pleased I was after a day of fishing, (sight casting for REDFISH in the Mosquito Lagoon) while wearing your product. I am a local charter captain and tournament angler that fishes the IFA Redfish Tour, FLW Redfish Series and other local events. Well, enough of that, I went out and bought 3 more glasses to set aside for my clients and one for me for the truck. Thanks again and I hope for you and your staff a Happy and successful year ahead. If there is anything I can do for you to get the word out or a personaal endorsement feel free to use my name!" I would like to let you know that the Eclipse #7389ca has helped me achieve over 50 world records for my customers and myself in the last 2 years. Rebecca Reynolds set over 42world records fishing with me in the last 2 years. She was the female saltwater angler of the year, and female fly angler of the year in 2003. Last year she was the 3rd place female angler in the world, 1st place female angler in the world for fresh water fish, and tied for 2nd place for female angler in the world for fly. I was awarded the 3rd place captain in the world for saltwater fish, and 2nd place captain in the world for fresh water fish. These awards were awarded by the IGFA. Rebecca also wears your sunglasses. I am a proud member of your pro staff and could not have been so successful without your sunglasses. I also helped several others achieve world records in the children's category. By the way, this is my third pair of Flying Fisherman sunglasses that I have purchased and in my opinion they are the best ever. Thanks. Just thought I'd tell you my story. I bought my first pair of Flying Fisherman sunglasses at a super Wal-mart store while living in Florida and working on the beach. I paid no more than $20 for them and they turned out to be the best pair of sunglasses I'd ever owned. I kept up with those things for a good two years (surprisingly enough) and the day that I was telling someone that exact same thing, I lost them in the ocean! For some reason or another, I didn't get another pair. I want to say that I went back to Wal-mart but they no longer had that particular style. Well, here it is about 3 years later and I went to Wal-mart again in search of these sunglasses, and the Flying Fisherman brand wasn't there at all. So I went to the Sunglass Hut and paid $207 for two pair that don't even come close in comparison to the quality. So I decided to look on the internet, found you guys, so the $100 pairs will be going back first thing tomorrow morning. I absolutely love these sunglasses, and I'm so glad that I know now where to find them. Thanks for making a great product at an unbeatable price. While traveling across the country filming for "The Christian Angler Television Series" it is very crucial that we have a great pair of sunglasses. Whether we're bass fishing in Florida or trout fishing in Arkansas it is very important that we have great UV protection and comfort. Most important to our success is our ability to see in shallow water. That's why the Master Angler series is our choice of sunglasses. Being in television it is quiet easy to find companies wanting us to promote their sunglasses. We've chosen to promote the "best". It's only Flying Fisherman for us. Give them a try, you will not be disappointed. I just wanted to say how pleased I am with my Flying Fisherman Sunglasses. This is my second year as a member of your prostaff and I couldn't be happier with my Action Angler Kingston glasses. I fish bass tournaments exclusively and the majority of those I am fishing in very shallow water. Without my Flying Fisherman Sunglasses I would not be able to see the submerged stumps, weed lines, and rocks that bass love to hide behind. The glasses are so light and comfortable, I sometimes forget that I have them on! You have a great product and I am so proud to be a part of the Flying Fisherman team. In bass tourmanent circles, polarized glasses are as important as any other tool we use, and I love to show off my Flying Fisherman at tournaments. I've been using the Kingstons I received earlier this year and I feel they are great glasses for the money. Just wanted to let you guys know I really enjoy your product and I tell everyone whenever I get the chance. I can't wait to try your higher end glasses after getting such good service out of the Kingstons. Thanks again and I'm proud to be on your freshwater prostaff. I've been using several pairs of Flying Fisherman polarized sunglasses, in different lens shades. I've fished in both freshwater and saltwater for many different species of sport fish across North America. From Mexico, through the US and into Canada, in any weather and water condition, your glasses make it possible to see far into the depths where big fish lurk. I've found your glasses to be of the highest quality, the best that I've ever used. 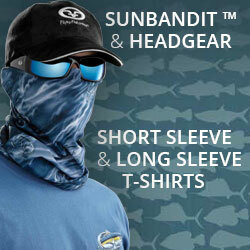 The smoke colored lenses are excellent for fishing during bright sunny conditions. Flying Fisherman smoke lenses reduce glare better than any other lens that I've used. I've found the amber lenses optimum during the low light periods of early morning and late evening. Amber lenses also excel at anytime that skies are cloudy and overcast. They gather fading light allowing me to see deep into the water even during the lowest light conditions. All shades of Flying Fisherman lenses make spotting sport fish and bait fish much easier. They also make it possible to see structural changes and pieces of cover deep under the water, while eliminating eye stain. The members of my outdoor team, The Simms Sport Fishing & Hunting Team, have also been using your products with great success. My team members and I agree that Flying Fisherman produces the best polarized fishing optics that we've ever used. With your help, we're able to guide our fishing clients to very impressive catches throughout Missouri, Illinois, Wisconsin, and Ontario. Thank you for providing products that enable us to locate and catch more and bigger fish during our tournaments, guided fishing trips, and recreational days on the water. The Mirage and the Eclipse sunglasses have been enjoyable as well as essential in guarding my eyes from glare and UV rays. I fish better because I see better while on the water and I highly recommend your eyewear to everyone. Your glasses are both stylish and functional and I wouldn't be caught outdoors without a pair. I have been wearing your Elites for sailing, driving, and yes, even fishing, ever since I was a mate at Robbies Marina in Islamorada in the early 90's. My last pair of amber's finally gave up the ghost... the frames can no longer be repaired. Found your website this afternoon, and placed an order with Discount Marine for more glasses. Thank you for a wonderful, and affordable, product. I haven't found anyone else's, at any price, that I have liked as well as these. "...I have been wearing your sunglasses for almost 10 years and love them. I first bought them in Florida and have been buying 6 pairs every time I go to Florida..."
"...I just returned from a flyfishing trip in the Eastern Sierras and a friend of mine had a pair of your glasses. I borrowed them for one afternoon and could not believe how great they were. I could see fish under shadows covering the surface as clear as if they were on dry land! You have just taken away my last excuse as a fisherman: I used to say that I couldn't see the fish!! Thanks"
"...I have owned 3 pairs of these sunglasses and it was about 8 years when I bought them and I have one pair left. I really have enjoyed Flying Fisherman glasses and I tell people about them being polarized glass and to try them. They are impressed. Flying Fisherman polarizes glasses is the only way to go in my opinion. I will order more tomorrow. Thanks"
"...I work at Bass Pro Outdoor World in Dania Florida. My job is receiving...I check in all the UPS, Fed Ex, etc. I checked in some of your Flying Fisherman T-shirts the other day and thought they were awsome! Gotta have one! Especially the one with the Tarpon on it!! Thank you for making a great looking T-shirt. "...we need Flying Fisherman sunglasses here in Northern Alaska. I'm catching lots of Salmon on fly and jigging Halibut on 20lb. Everybody wants my sunglasses! Help...send some to us A.S.A.P." "...my friend lost his beloved Flying Fisherman sunglasses and has grieved long enough over his loss so I am going to break down and give him a pair for Christmas. Thanks for being there." "...my husband "swears by" your sunglasses and is now wearing a pair that is sooooo old! 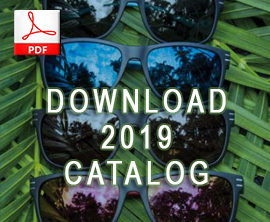 I am interested in purchasing your sunglasses locally in addition to receiving a catalog. "... I have used the same pair of your sunglasses for the past ten years. I bought them in Islamorada Florida Keys while on holiday in 1989. They have been the best sunglasses I've ever tried (and this is not said lightly) due to having professional fishing friends who get a wide range of products to try out. How much would it cost for a pair of Pro Teardrop 7565p including shipping to the UK. Thank you very much." "...I want to thank you for the sunglasses which you gave me. You have a great product that I have no hesitancy in recommending to any fisherman or outdoorsman. Sincerely"
"...thank you for producing a great product. I am on my second pair of Flying Fisherman's. My first pair I bought in Annapolis and loved them. I loaned them to my brother who dropped them overboard. It took several years before I came across them again. My wife got a pair too and now we can both see under the water with our Flying Fisherman's. Keep up the good work, and good luck." "...I spoke with you today in reference to dealer locations so that I may purchase your sunglasses. I read the accolades users had for product and I agree with their satisfaction in your product. I've had a pair of your sunglasses for 18 months and are very pleased with them. Thanks." "The Cay Sal are some of the nicest glasses I've ever owned. Just a great pair of glasses"
"I am a kayak fisherman and the last few years I have used Flying Fisherman. I have tried more expensive brands such as Costa, Maui Jim, Oakly and none seem to work as well as yours. I have three pairs of the magnums & I love them!" Great sunglasses, great apparel and great prices. What really makes the store stand out is the employees! They always have a smile and are eager to help you. Every time I go in they make you feel like you're an old friend. A true pleasure. You will not be disappointed. I truly appreciate you getting back to me and locating the parts I needed for my sunglasses in such a timely fashion. I wanted to express that as a business owner myself I must admit, this says a lot for your company. These are my favorite sunglasses & I hope to get many more seasons from them. With Consideration on the quality of your company’s products, its staff and how seriously you take your clientele, I am most decidedly going to highly recommend Flying Fisherman in the future. “I have a story about the durability of the Flying Fisherman sunglasses. Myself and fellow pro staff member Hal Abshire were fishing a tournament this past Saturday on Shearron Harris Lake in North Carolina. I was wearing a pair of the 7395 Mirage sunglasses as we were blasting off. Hal has an accessories holder in the pedestal seat in the front of his boat, and on this particular morning, he had a couple cans of fish attractants in aerosol can in the holder. As we reached approximately 65 mph, one of the caps came off of one of the cans. It flew back, and hit directly on the lens portion of the glasses. It startled me to say the least, but to my amazement, that was it. The glasses performed one of their important functions, protection of angler's eyes. The only damage that happened is a mark on the lenses where the cap hit. There was no cracking, breaking or any other damage, most importantly to me. "I've been on the water my entire life-from the Chesapeake to the Bahamas. For years I spent hundreds of dollars on expensive, polarized sunglasses that I either broke or lost. Then I discovered Flying Fisherman sunglasses-hands down the best quality product at the best price on the market. Now I don't go to sea without them." I want to tell you guys THESE ARE THE BEST SUNGLASSES I HAVE EVER OWNED IN MY WHOLE LIFE!!! I'm 17 years old. I really love these sunglasses (and) I'm not lying to you! I wear them all the time. I even fell asleep with them on before. Thank you?? I was surfing the web and found your site. Was worth risking hot water with the boss your designs just blew me away! I collect tarpon T-shirts and have assembled a vast array of them over the past 15 years or so, but I have never seen anything quite like the artwork that you sell. Just beautiful. I had to send an order right away! I'm happy to provide the following testimonial. I purchased a pair of 7835 sunglasses a couple of years ago and have been very pleased. I've found them to be durable, comfortable and effective. And when you combine that with a great price, we're talking real value! I lose a lot of sunglasses and I'm sure the only reason I've managed to keep this pair so long is that I like them so much. Thanks for a great product! I picked up a pair of Flying Fisherman sunglasses about two years ago. It wasn?t until a (recent) trip to Disney World that I truly realized the superb clarity and performance qualities of Flying Fisherman sunglasses. During this trip I was looking into a stream and was able to see fish from high atop a bridge in the Magic Kingdom, unfortunately my family wearing standard sunglasses were unable to see the fish. My son was awed by this ability. While (on a trip to England) I spoke very highly of Flying Fisherman sunglasses with family and friends (all avid fishermen). Now I have requests from England for Flying Fisherman sunglasses! I bought a pair of your tournament series glasses 4 years ago and I can honestly say that they have helped me spot more fish in the water than I ever thought possible. Catching them has been another story! I'm interested in getting a pair for my father and my wife. Last year I came across your fine products in the Bahamas, on Andros Island, where I've vacationed and brought clients bonefishing for years. One of my guides there had received a pair of your glasses as a gift and raved about them. I tried them and had to agree. For the money, they were the best I'd seen. Since I can personally recommend your product?s effectiveness and appropriateness in two venues, Striped Bass flats and Bonefish flats I thought I'd contact you. I recently purchased a pair of Cayman Flying Fisherman sunglasses and I love them! Their polarization is excellent and their fit is as good as sunglasses that I have paid $60 to $70 for. First of all, I am very pleased with the performance of your products over the past 12 to13 years. I was wondering if you had any promotional items that you could (send) me to display while assisting you in advertising your companies quality products on all of my many fishing and hunting trips in Newfoundland, Labrador, Northern Ontario, Northern Alberta and other places in the future. Keep up the great work! Grand Falls-Windsor, Nf & Lab. I have used your product for over ten years and would not use anything else. I went in search for your site on the advice of a Florida expatriate that lives here in Yap. I asked for the best polarized lens on the market and Flying Fisherman was the first thing out of his mouth. What would it take to become a dealer? I went to the only place I know of to get a new pair of your (Flying Fisherman) sunglasses. I have never had a pair of sunglasses that lasted as long as your?s do. I finally sat on them after 2 years of enjoyment. Actually, I sat on them several times until I finally did them in beyond repair! I have been buying your products for about six or seven years and think that for the price they are the best there is. The quality is better than glasses costing twice as much and in some cases even more. I can not see paying a hundred dollars or more for glasses that I am eventually going to break or loose. My current pair has lasted well over a year and have held up beautifully under less than optimum conditions. I purchase your products through Crook & Crook tackle shops but have not seen much advertising for your company. I found your website through a link in Florida Sportsman.com. My favorite type is the #7565, teardrop in black. Once again, thank you, it is hard to find many companies who turn out a quality product at such a great price and when I find one I like to let them and anyone else who may be interested in that product know how satisfied I am. "...Ever since my wife broke my last pair of Jimmy Houston glass polarized I've been on the lookout for another set. These Flying Fisherman glass polarizeds are lighter than the Jimmy Houston ones. I really like them." "Between your sunglasses, shirts and caps, I am a walking poster-boy for Flying Fisherman products--and darn proud of it. Keep up the great work." "...I conned a pair of your sunglasses from a friend of mine that uses them religiously. What a great product! They are my absolute favorite, and I wear them all summer long." "...I have a pair of your 7565 which are easily the best sunnies I have ever owned. I would like a couple pairs of your newer styles i.e. Caymans or Stalkers. Can you tell me here in New Zealand I can get them?" "...I presently use your sunglasses on a daily basis, I have found none better regardless of price. Congratulations on a great product."